PLANT: Perennial herbs; trichomes glandular and stellate, often woolly; stems 10‑100 cm tall. 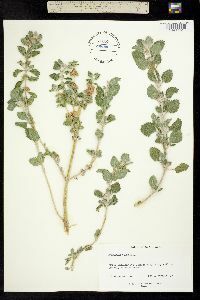 LEAVES: petioles 0.5‑5 cm long; blades strongly rugose, broadly ovate to orbicular, 1.5‑5 cm long, 1.5‑5 cm wide, reduced distally; margins crenate to dentate; bases slightly cordate, truncate or broadly tapering. INFLORESCENCE: bracts petiolate, much exceeding the verticils. FLOWERS: calyx actinomorphic, 3‑6 mm long, with an internal fringe of hairs at the throat of the tube, the teeth usually 10, alternating large and smaller, the apices curled hooks; corolla white, 5‑10 mm long. NUTLETS: ca. 2 mm long, black to dark brown, bumpy. 2n = 34 (36). NOTES: Along roads and in riparian zones from Sonoran Desert to ponderosa pine communities: expected in all AZ cos.; documented in: Apache, Cochise, Coconino, Gila, Graham, La Paz, Maricopa, Mohave, Navajo, Pima, Pinal, Santa Cruz, Yavapai, Yuma cos.; 300‑2450 m (1000‑8100 ft); Mar‑Oct; extensively naturalized in the New World, including all states of the U.S. except FL, LA, ND and NH; Eur. 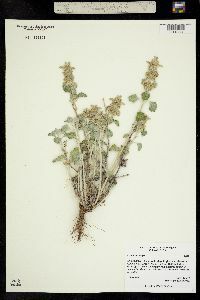 Introduced for medicinal uses and as a flavoring for horehound candy. 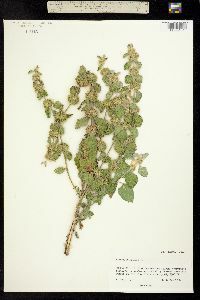 The combination of woolly pubescence, strongly rugose and often nearly circular leaf blades and curled sepal tips distinguishes this plant from other AZ mints. REFERENCES: Christy, Charlotte M. Lamiaceae. 2003. J. Ariz. - Nev. Acad. Sci. Volume 35(2). 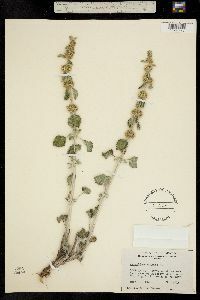 This plant has been cultivated for its medicinal properties since pioneer times. It has escaped from gardens to barnyards, roadsides, open woods, and woods pastures. I have found it to be common in hogyards where the hogs had killed all other vegetation without disturbing this plant. 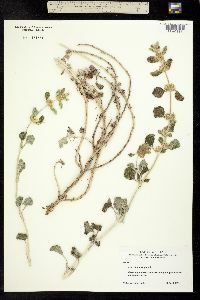 Taprooted perennial, the stems generally several, 3-10 dm, nearly prostrate to suberect, conspicuously white-woolly; lvs wholly cauline, canescent-woolly or partly subglabrate, not much reduced upward, petiolate, the blade broadly elliptic to rotund-ovate, evidently crenate, 2-5.5 cm; cal stellate and often ±long-hairy, the tube 4-5 mm, the 10 narrow, firm teeth somewhat shorter, eventually widely spreading, their spinulose tips recurved from the first; cor whitish, slightly exserted, with subequal lips; 2n=34, 36. Native of Eurasia, escaped and established in disturbed habitats nearly throughout the U.S. and s. Can. June-Aug.